How Deep Do You Plant Bulb Onions? How Long Does It Take an Onion Seed to Grow? How Deep Do You Plant Onion Sets? Onion bulbs, also called sets, should be planted at a soil depth of 1 1/2 to 2 inches, with pointed end up, and 3 to 4 inches between bulbs. Set a ruler in a vertical position against the onion with one end resting on the base of the onion where the plant enters the soil. Measure 4 inches from the onion's base and mentally mark where this is on the plant. Grasp the onion leaves together. Use sharp scissors and trim the onion plant at the 4-inch mark. Discard the cut leaves or throw them into your compost pile. Repeat the trimming process as needed to keep the onion plants at a height of 4 inches until harvesting. Onions are ripe and ready for harvest when 25 to 50 percent of its tops have wilted and the onion bulbs have grown a paperesque skin. Prepare a raised gardening bed in late August to early September. Till the gardening area. Add coarse organic compost, sand and peat to the raised soil mixture to provide adequate nutrients and promote drainage. Cover the area for 72 hours, allowing the soil to settle and nutrients to disperse. Lift the covering off the raised gardening bed. Cover with a 2-inch layer of plastic mulch. Separate the mulch to form small, open pockets for planting the onion bulbs. Dig a 2-inch deep hole in each pocket with a bulb digger. Place one onion bulb in each hole. Cover with 1 inch of organic potting soil. Soak the raised onion gardening bed with water. The ground should be saturated with water, but without standing puddles. Unroll chicken wire over the raised onion gardening bed. Make certain all the plastic mulch pockets, with planted onion bulbs, are covered. Cut the excess chicken wire from the roll. Secure to the ground with gardening stakes. Raise the height of chicken wire as the onion tops grow. Remove chicken wire after onion tops are 8 to 12 inches tall. The wiring protects shoots from wildlife consumption. 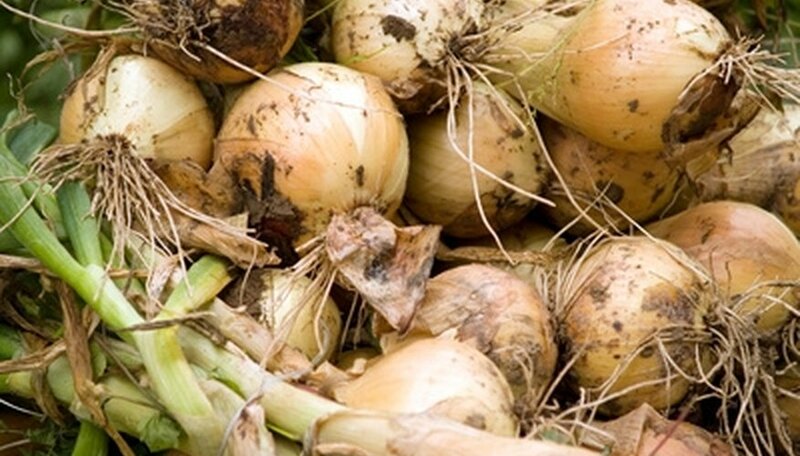 Start onions inside eight to 12 weeks before the last expected frost in your area. Fill trays or cells with moist, sterilized seed starter. Moisten the starter by pouring into a large bowl and adding water. Stir to mix well. Plant onion seeds to a depth of ¼ to 1/2 inch and press the soil down firmly with your hands. Plant three seeds to a cell or peat pot. Water to thoroughly moisten the soil and set in a warm location. Bottom heat speeds germination. The top of a water heater provides gentle bottom heat. Check daily for germination. Onion seeds germinate in five to 14 days, depending on the cultivar and the soil temperature. Move to a sunny location and keep the tops trimmed to a height of 4 inches. Keep soil moist. Transplant to the garden when the danger of frost has passed in your area. Place the bunching onions into the colander immediately after pulling them from the soil. Run water lightly over the onions to remove soil. Lay a double layer of paper towels onto the counter and spread the bunching onions out onto the paper towels. Cover the onions with another double layer of paper towels and blot the onions dry through the paper towels. Wrap the onions in a double layer of moistened paper towels. The moist paper towels will help keep the onions from drying out. Insert the bunching onions into the food storage bags. Seal the bags almost completely and squeeze out as much excess air as possible from the bags. Close the bags completely. Place the onion bags in cool storage (32 degrees Fahrenheit is ideal). Keep the onions for up to four weeks at 32 F. Storage time will decrease as the storage temperature increases. 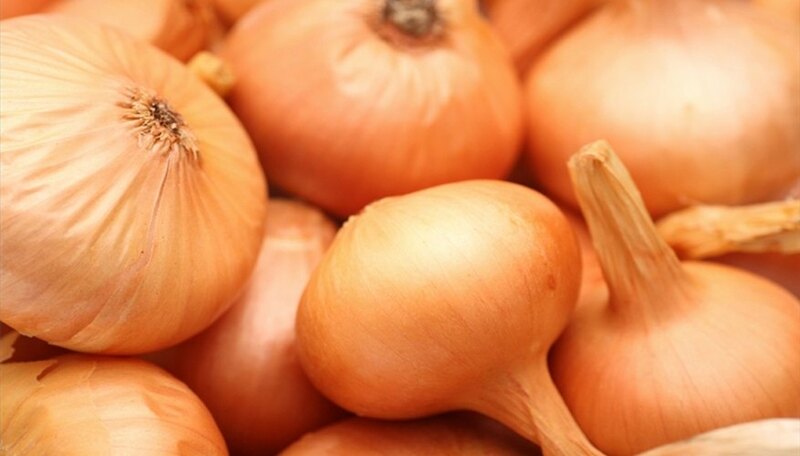 Keep onions for approximately one week at 50 F.
Prepare the growing area as early in the spring as possible. Work the soil with the garden spade down to a depth of approximately 6 inches. Add a 2-inch layer of compost to the top of the soil to improve the quality of the soil. Work the compost in with the garden spade. Rake the soil surface smooth to finish preparing the growing area. Select tiny red onion bulbs for best results. 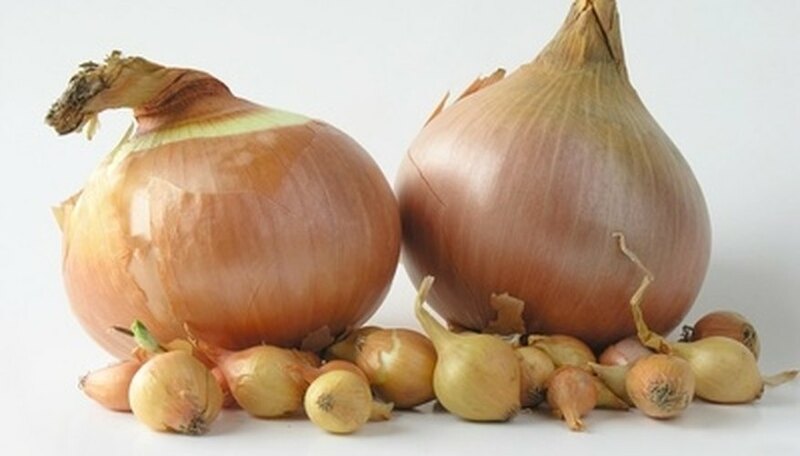 Onion bulbs smaller than a nickel will produce adequate onions. Dig holes for the red onion bulbs approximately 3 inches apart. Make the holes only deep enough to cover the bulbs with a thin layer of soil. Make rows 1 foot apart. Place the red onion bulbs into the prepared holes with the roots facing down. Cover the bulbs with soil and pat the soil firmly over the onions. Water the newly planted red onion bulbs generously after planting. Keep weeds away from the onions by pulling them by hand. Harvest scallions, or green onions, when the tops are about 6 inches tall. The younger they are the milder their flavor will be. Harvest mature onions when their tops turn yellow and begin to topple. 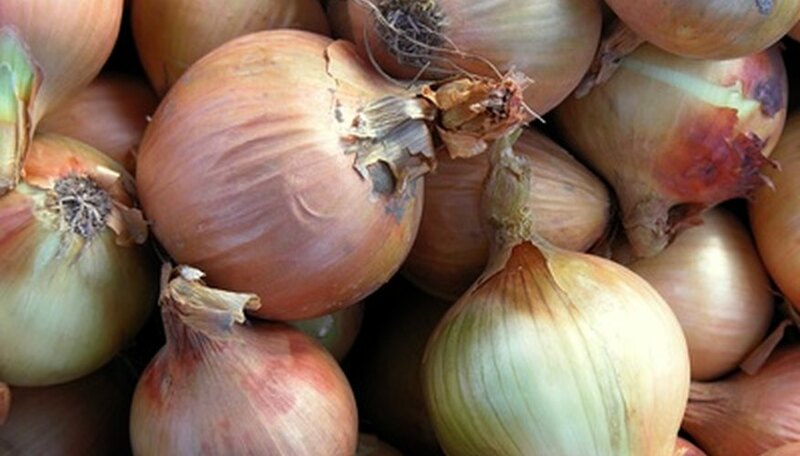 Loosen the soil around each bulb and pull or dig it up carefully; damaged onions rot quickly. Spread the bulbs - tops intact - on a flat surface above the ground and leave them until the skins are dry and the tops have withered completely (2 to 10 days outside; roughly two weeks indoors in a well-ventilated spot). Cut off the tops, leaving about an inch of stem, and store the bulbs in mesh bags in a place that's cool (35 to 40 degrees F), dry and well-ventilated. Check your stash frequently; if any bulbs have sprouted, use them right away. Plant green onion bulbs two weeks before the last known frost date or when daytime temperatures reach 45 degrees F. Choose a site that receives at least six hours of direct sunlight each day. Till the soil to a depth of about 8 inches and remove any rocks or soil clumps. Dig a trench about ½ inch deep to plant the bulbs. Place them in the trench with the pointed end facing up. Space the onions 1- to 2-inches apart as green onions need less room to grow than storage onions. Cover the green onion bulbs with ½ inch of soil. Tamp the soil down around the bulbs to remove air pockets. Water the onion bulbs well. Harvest the green onion bulbs as soon as they grow to desired maturity. Simply pull them from the ground with a gentle upward pull. Wash the green onions and store in the vegetable drawer of the refrigerator. Prepare the garden space by tilling the soil and adding 1 to 2 inches of compost to the area. Retill to mix the compost into the soil. Create rows in the garden space, using a hoe, approximately 1 foot apart and 1 1/2 to 2 inches deep for scallions and 1/2 inch deep for large onions. Place the onion seed starts into the row at intervals of 1 inch apart for scallion-sized onions and 4 inches apart for large onions. Use the garden trowel to cover the onion seed starts, keeping the green sections of the seed starts upright in the row. Harvest scallions in approximately 30 days. 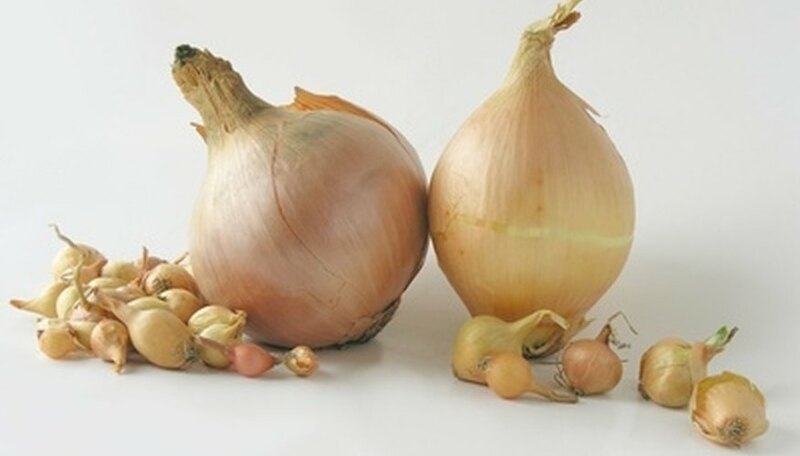 Bulb onions will take approximately 90 to 120 days to mature. The green tops of the onions will turn brown and fall over when the onions are mature. Select an area that receives at least 8 hours of sunlight each day. Bunching onions need as much sunlight as possible each day. Soil quality is not important. 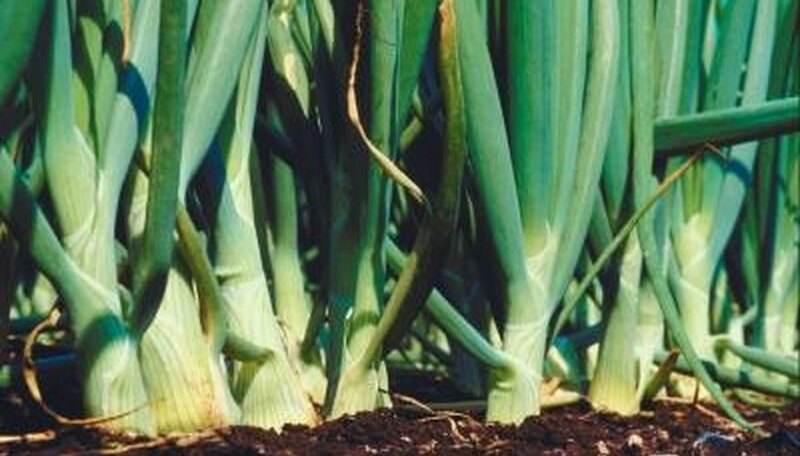 Bunching onions adapt to all qualities of soil, but cannot tolerate shady conditions. Break up the soil with a spade or hand tiller. Till the soil at least 5 inches deep to enable the roots of the bunching onions to penetrate more easily. Water the soil thoroughly, and allow excess water to drain away for an hour or two. Sow bunching onion seeds on the surface of the soil. Space the seeds as evenly as possible, and sow a maximum of 25 seeds per square foot. Cover the seeds lightly with a dusting of dry potting soil. Water every two to three days, unless the soil dries out sooner. The seeds will germinate within two weeks. Harvest time varies according to the type of bunching onion planted, but usually takes 56 to 119 days. Typical yield is 1 pound per square foot of planted seeds. Purchase a container that is several feet wide or long, and about 1 foot deep. If the container does not have drain holes, cut or drill holes in the bottom of the container. Fashion a catch for the water that drains out of the holes; place a tarp over a long cardboard box, or use a plastic tray. Mix soil and compost together--one part compost to five parts soil. Fill the container to about 10 inches. Plant onion sets at least 3 inches apart, and deep enough so the very top of the set is just under the soil. If you start with sets, you will have onions this year. However, if you start with seeds, you will not have onions until the second growing cycle. Water the onions between 2 to 3 inches a week. If the top of the soil feels dry, water the onions more. Give the onions at least six to seven hours of light each day. If you do not have a window that provides that much light, use a fluorescent or shop light over the container to provide additional light. Harvest the onions when a quarter to half of the stalks have fallen over and the skin on the top of the onion is like thin paper. They may not all be ready at the same time, so inspect each onion before pulling it out of the soil. Harvest green onions when the plant (top) is about six inches tall. You can let them grow longer for a more potent green onion, if desired. Grab a hold of the top, near the soil and pull. You do not need to dry out green onions. Wait until about 85% of the tops are fallen over for traditional onions. Then go ahead and bend over the rest. Leave the onions in the ground for 10-to-14 days so they can mature. Choose a sunny, dry day to harvest. This important since harvesting onions when it is rainy or humid can prevent proper drying. Pull the onions out of the ground. Grab a hold of the tops close to the ground and yank them out. Lay the onions out until evening time to dry. If it very sunny and bright out, move the onions to the shade to dry out so they don‘t burn. Move the onions to a dry area before evening so they don’t get wet when dew forms. Braid the top and hang them to dry for 2-3 weeks to completely dry them out and cure. Examine your onions before storing them to ensure there are no blemishes or bruises on any onions. Bruised onions can quickly spread decay throughout surrounding onions. Separate any onions with bruises and use these onions first without placing them into extended storage. Place the onions with their papery outer coverings intact into the mesh bags. Fill the mesh bags approximately half-full to ensure adequate air circulation to all of the onions in the bags. Hang the mesh bags in a location that is cool and dry. Temperatures between 50 and 60 degrees F are ideal for long-term white onion storage. Store the white onions for two to four months in this location. Select a container with drainage holes on the side of the container about 1/4 inch up from the bottom. Ideally, the container should be 6 inches in diameter with a height of 6 to 10 inches. Mix 1 part perlite, 1 part sterile potting soil, 1 part sphagnum peat moss and 1 part composted cow manure. Add the medium to the container. Plant up to six green onion transplants in one container. Use Beltsville Bunching, Crystal Wax or Evergreen Bunching varieties for container gardening. Poke your finger in the medium to make a hole deep enough to fit the tiny roots. Place each transplant in a hole and cover with medium, lightly packed soil. Place the container in an area that has full sun for three to four hours and shade for the rest of the day. Water the green onions once a day, but do not allow the soil to become soggy. If you notice that the soil is still moist the next day, wait a day before adding more water. Visit your local seed supply company to purchase potato onions sets. Potato onions may be packaged and sold in mesh bags or may be sold in bulk.They may be labeled as multiplier onions. Look for onion sets that are firm and healthy. Bulbs should be covered with papery onion skin. Bulbs without skins or that feel soft and mushy should be avoided. Examine the growing tip of the onion set. Although a small green sprout at the end is acceptable, avoid those with sprouts longer than1/4 inch. Buy approximately 30 to 40 onion sets for a 10-foot row of onions, depending on the intended spacing between onions. To allow adequate room for potato onions to multiple, space 4 inches apart. For young green onions, onion sets can be planted 2 to 3 inches apart. Onions, planted from seed in full sun and well-draining soil, germinate within 21 days of planting. Harvest time depends on which type of onion is preferred. Scallions, or green onions, should be pulled when the bulbs are 1/2 to 1 inch in diameter, while fully mature onions are ready for harvest when the tops die off, in mid to late autumn. Fill your seed trays with sterile vermiculite. Plant onion seeds between 1/4 and 1/2 inch deep in the sterile vermiculite. 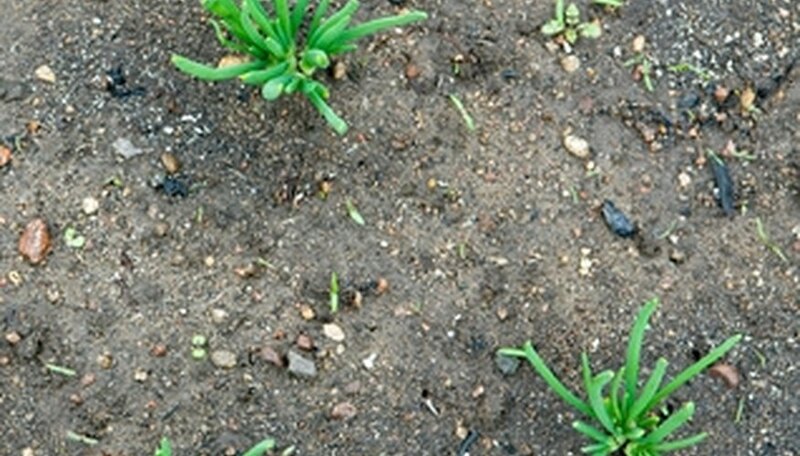 Onion seeds are best planted three per cell or in dense rows when planted in 4- to 6-inch deep containers, says the University of Minnesota Extension. Water the soil so that it is moist, and keep the soil moist while the seeds are germinating. Place the tray by the window to raise the soil temperature and germinate the seeds. Keep the onion tops trimmed to 3 or 4 inches tall. Harden the onion plants by setting them outdoors, after the threat of frost has passed, for longer periods each day before planting, says the University of Minnesota. This prevents cold damage. Plant the seedlings in the early spring, spaced 4 to 5 inches apart, with 12 to 18 inches between rows, says the University of Illinois. Plant onion seeds 1/4 inch deep, spaced 1/2 inch apart. Seeds can be planted directly outdoors three to four weeks before the last frost or indoors six to eight weeks before taking them out. Seeds require 10 weeks to reach transplanting size. Plant onion sets, or small bulbs, directly in the ground to a depth of 2 1/2 inches. Space sets 1 inch apart until they reach transplanting size. Transplants, or seedlings, are planted 1 inch deep and spaced 3 inches apart. When seeds and sets reach transplanting size, thin the plants to 3 or 4 inches apart to allow room for bulb growth. Use the thinned plants for scallions. Schedule your onion planting for when the frost has past. Acclimate the seedlings over a two-week period, gradually getting them accustomed to the outdoor environment. This process is referred to as “hardening” and involves setting the seedlings outside in a protected area, out of the direct sun for several hours each day. Over the two-week period, gradually expose the seedlings to more sunshine, and each day leave the seeding outdoors for a longer period of time. Plant the seedlings in a row, spacing them 4 inches apart. Do not plant deep, just enough so that they are in the soil. Water the onions once a week, with about 1 inch of water. Keep the soil moist. 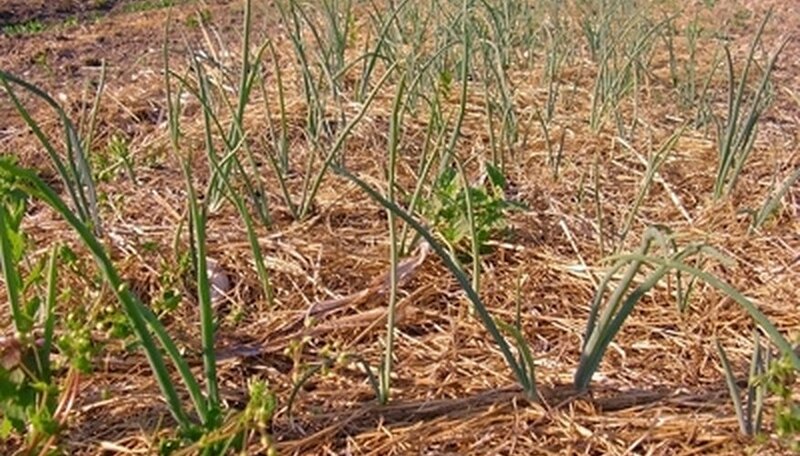 Because onions have shallow roots, they require consistent irrigation. Fertilize the onions when the plants are about 6 inches tall and again when they are 12 inches tall. Do this by scattering 1 ounce of fertilizer for each 10 plants, along the sides of the row. Plant onion sets, or dormant bulbs, 1-½ to 2-½ inches deep in a location with full sun. 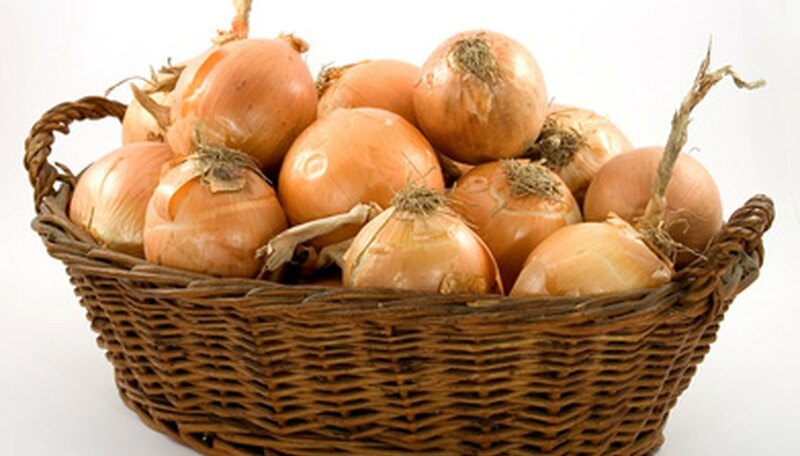 Onions require well-drained soil high in organic matter and consistent moisture. Space the sets 3 to 4 inches apart in rows. Leave a space of 12 to 15 inches between rows. 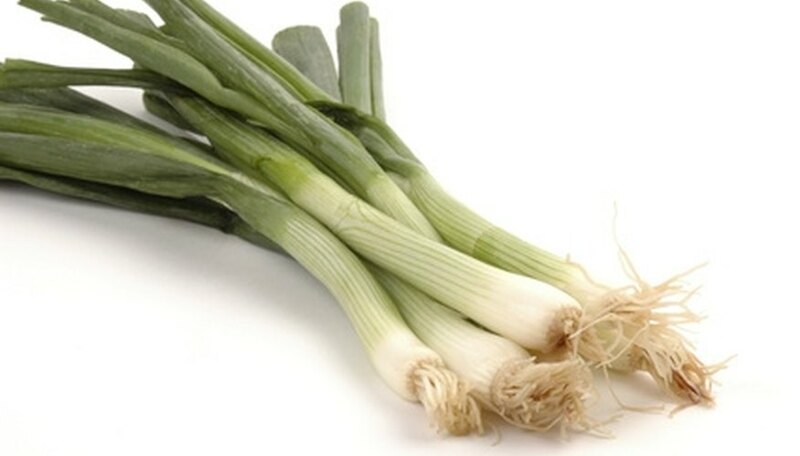 Harvest every other plant after a month and a half to use as scallions, also known as green onions. 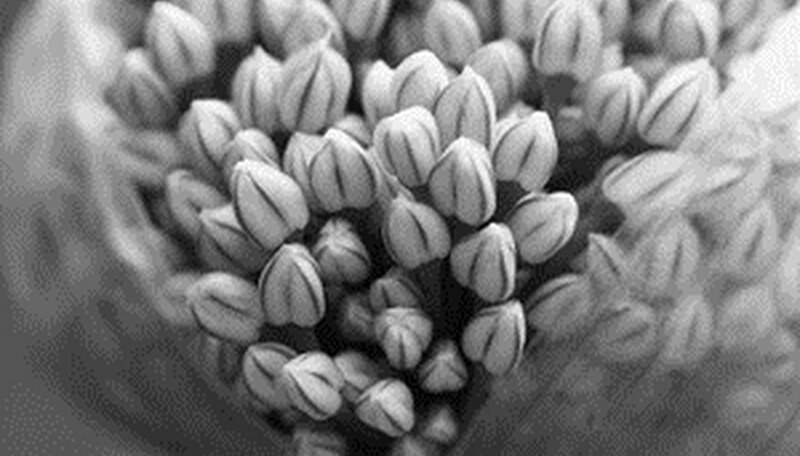 Thrips, onion maggots and soil-borne diseases are common among onion plants. Avoid problems with these pests by planting onion sets in a different location each year. Keep the onion sets free of weeds and mulch with grass clippings or straw to help keep the soil moist. Dig up as much of the plant as possible with a spade. Do not pull the weeds out of the ground by hand because the bulb will pull away and spread seeds. You will be inadvertently helping spread more wild onions this way. Do not shake the dirt off the plant when you dig it up or you may spread its seeds. Do not compost the plant. Throw it away immediately to prevent it from propagating. Apply an herbicide per the instructions on the package, or pour boiling water on the spots where you dug up the onions. Gardening Know How warns both herbicide and boiling water will kill your other plants, so use with caution. Repeat the above steps whenever you see new wild onion plants appearing in your garden.